Each logic gate has four inputs with each input capable of being set as an AND, OR, NAND or NOR function. The gates output can also be inverted. 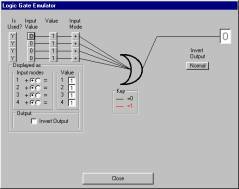 To simplify operation a software ‘Logical Gate Emulator’ is included as part of PodFlow allowing a simulation of operation.